That alone would normally make for decent poker headlines. 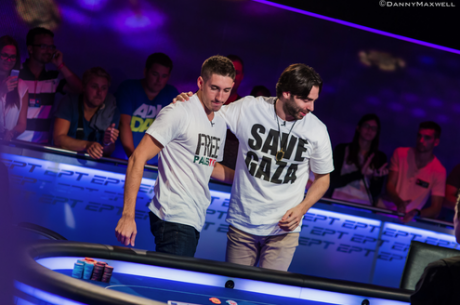 Busquet and Colman took some TNT with them to the final table though, deciding to wear t-shirts that read “Free Palestine” (Colman)** and “Save Gaza” (Busquet). Now the inevitable and equally predictable backlash to the censorship of political statements at events is coming in. Whether you agree with Colman and Busquet’s political leanings is irrelevant to this post. We are focusing simply on this: Does PokerStars, WSOP, WPT, and HPT have the right to censor political statements or what they view as inappropriate content from their events and broadcasts? International corporate entities like PokerStars can set whatever standards they’d like for what they feel is the best interest of their brand and profits. PokerStars’ founder, Isai Scheinberg, and CEO pre-Amaya acquisition, Marc Scheinberg, are Israeli. A sizable swath of their customer and employee base are Isreali. If they don’t want to alienate that customer and employee base, they have the right to do so. Further, PokerStars is now owned by Amaya, a publicly-traded company (AYA:Toronto). PokerStars doesn’t just have to answer to customers and employees, they have to answer to shareholders as well. This issue isn’t about free speech as we know it in America. It’s about business. And PokerStars made a reasonable business decision. An appropriate response to that then is: where do you draw the line? PokerStars’ statement was fairly broad. What is acceptable? What will be tolerated? That’s for PokerStars to decide. If you don’t like the policy, don’t play the events. Pretty simple. PokerStars is acting in what they feel is in the best interest of the business. The small number of people who may stop playing their events because of that decision is significantly fewer than the customers, employees, and shareholders they potentially alienate by not taking action. * Busquet won, banking €896,434. Colman took home €843,066. Yes, there was a heads-up deal made. Read more here. 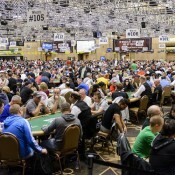 Dan Colman is right about poker and bold to express an opinion other than “buy our crap”. You’re going to lose your audience here, WCP. You’ve done well from this industry but now you need to take a step back think about what’s right and wrong for all of us as people. It makes sense that Colman loves Palestine. They also think that poker is a sin and worthy of punishment. If only he could somehow escape his captors who have forced him to play these high stakes tournaments. Then, I am sure he would go to Gaza and join the fight to annihilate Israel and Jews the world over. What a hero he would be. 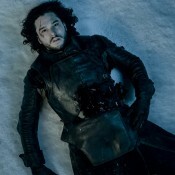 But alas, he cannot escape and is forced to play poker. How sad. This is such a poorly thought out article. Bordering on stupidity. What if restaurants said you don’t like my racist policy, don’t eat here? Or, if TV stations start censoring what people start saying? Is it just business? There is a reason why freedom of speech is so important. The US had a history of censorship. Only 50 years ago, people were jailed for speaking out against the government. Look it up. The 1st Amendment only protects speech in government affairs but it should extend to private companies as well. We should be advocating free speech, not curtailing it.